Take such a practical tent for daily use! It will provide you with happy time in the open air! For this tent, made with premium steel, 90G/M2 PE materials and delicate treatment, it ensures great durability and reliability. It can be conveniently carried and stored due to its smart style. In addition, waterproof material makes it extremely fit for outdoor activities. It is easy for installation and disassembly! 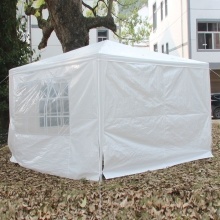 Do have a try of our 3 x 3m Four Sides Portable Home Use Waterproof Tent!